Now I have to confess why I was so driven to learn how to learn to do this kind of knitting. I attended my first KR knitting retreat this past fall and met lots of wonderful people and feasted my eyes on some of the most exquisite knitting. There was one piece of knitting, actually just a sleeve, that one of the more accomplished knitters and a spinner, I might add, was working on. Her name was Bess and her sleeve was referred to as part of the KipFee. What is a KipFee? I have no idea, except that it's a sweater. You can meet Bess and her KipFee here. What is so strange about my fascination is that I'm not a Fair Isle kinda girl. It's not something I would ever wear. I just couldn't get that sleeve out of my head. I found myself drawn to that sleeve as if I were hungry! 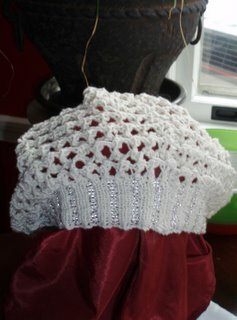 Now this little hat that I made up as I went along, is a poor substitute for that sleeve, let alone the KipFee itself, but I love it. It makes me happy to look at it. I wish I had left the off white out of the pattern, but I haven't been this proud of something since I knit my first scarf when I was 15. So thanks Bess. The second pic of the hat is the inside, of course. I had to prove that I really did it! The white lacy hat is my first knitted bead project. It didn't think it would be fun, but it was a hoot. 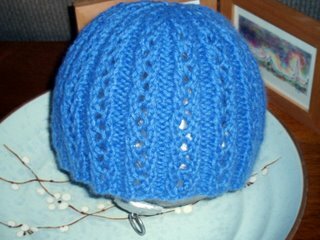 The blue cap is a quick lace rib in cashmere. 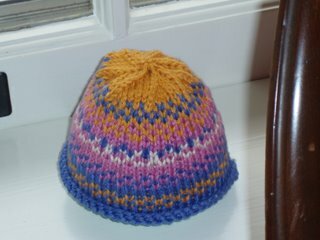 BTW, all the baby caps are made with Shine from Knitpicks. They had to be non-wool and machine washable. In fact, thank you for the compliments. I'm equally impressed with your beautiful lace knitting. 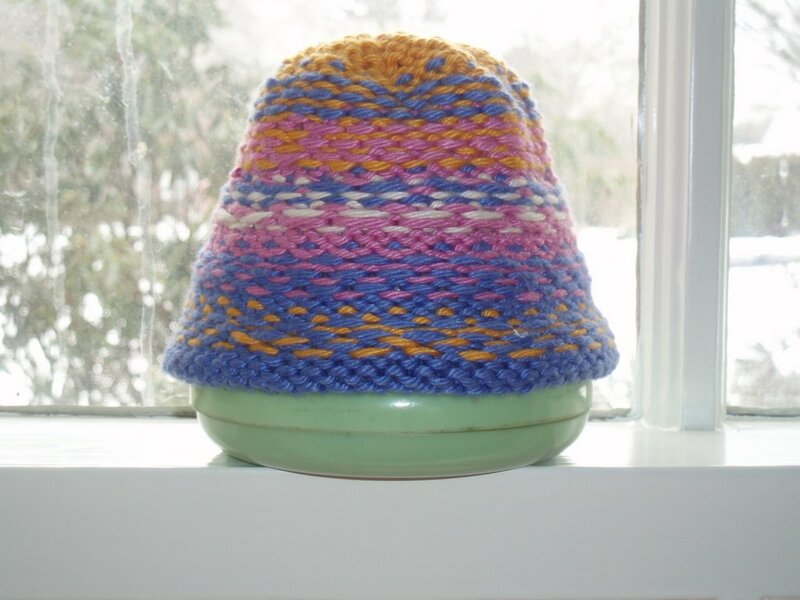 The KipFee is a nickname for the kit I'm knitting - I always name my projects and this one got a sort of blend of English and Continental pronunciation to honor the many English and Continental knitters out there. The realname of this sweater is the Knit Picks Pallette Fair Isle Cardigan. Way too many words! so it became the K n I t Picks pallette F air I sle sweater - with the "I" being given the European pronunciation. Lots of explaining for a little word, Hmmm? Glad you liked the sweater. It's almost done. I don't think you should describe your beautiful little hat as a poor little (now I am drawing a blank). It is lovely and you are justifiably happy with it. You did a great job. I could see a lot of people knitting just such a hat. Wow is all I can say. Very nice work. Rosi- If you keep knitting, you will have a lace shawl for everyone at next year's retreat! Your work is beautiful!